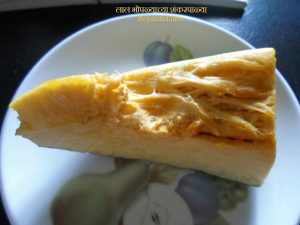 This is a Recipe for making at home sweet and delicious Red Pumpkin Shankarpali or Lal Bhoplyachi Shankarpali as this Shankarpali variation, specially experimented by me is called in the Marathi language. This Shankarpali makes a nice and handy snack, it can also be added to the annual Diwali Faral Sweets for more variety. Wash the Pumpkin, peal, and shred and steam it on a slow flame. In a big size bowl mix the Pumpkin, Jaggery, Salt, Wheat Flour (or as per requirement), Hot Oil and prepare a thick Dough and keep it aside for ten minutes. Then prepare four equal sized balls from the Dough. 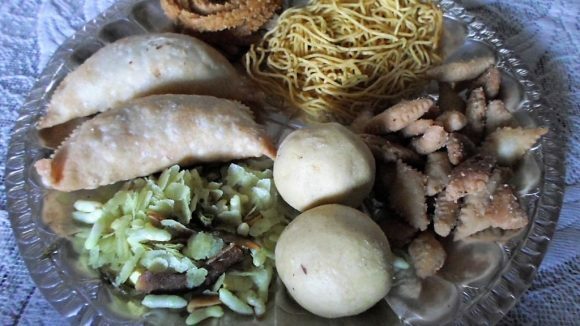 Roll the balls one by one like Chapattis and cut into diamond shapes using a Shankarpali Cutter. Heat the Oil in a Kadai and deep fry the Shankarpali until the color changes into light brown. Then store into a Plastic bag and then keep them in airtight Container.